The retrofit CARBOTEX� seat heater system gives you all features and quality you would expect from an original equipment manufacturer. 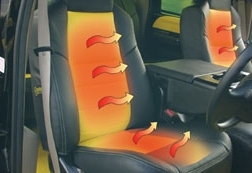 The application of carbon technology ensures the even spread of warmth to both the seat back and cushion. Feel comfortable in minutes. The carbon fiber design provides flexibility and strength. Thermostats in each panel ensure quick, even heat, and the heat generating panel can be cut to fit virtually all trim styles. Carbotex (carbon fiber) seat heating panels. Engineered and manufactured by the global leader in automotive seat heating, provides a technical as well as quality advantage over other seat heater kits currently on the market. The felt construction of the woven panels ensures that the heater will not physically break down or tear apart with use. Extensive occupant testing to OEM automotive specifications has demonstrated the superior level of safety and strength of these panels. The use of carbon fiber (Carbotex�) provides many advantages of wire panels used in other seat heater kits. The carbon fiber pattern, resistance, heat dissipation, heating filament and heat density are all engineered to provide the highest level of performance and safety. Carbon fiber conducts via many very fine strands of carbon to carry electricity which allows for even more heat, as well as flexibility and strength. The carbon fiber panel can be cut to adapt to individual seats or pull pieces - a feature that is not available with wire panels. A minimum of part numbers needs to be stocked, adding to your cost advantage. The Seat Heaters operate with one thermostat in each panel. This is done to ensure comfort and to prevent excessive heat buildup. The thermostats are creep action (as oppose to snap action) which provides superior heat control. They are sealed to ensure that they are waterproof. Attaching wires are flexible to prevent breakage. These thermostats are more cost-effective than others commonly used, and they provide extra insurance that the seat cannot get hot enough to result in a fire. Switches and wire harnesses are also of the highest quality. The switch is simple and reliable. Its round shape makes it easy to install (just drill a hole!) by eliminating alignment issues commonly associated with square or rectangular designs. The wiring package included with each kit was designed with input from automotive upholstery experts. 20" leads with small connectors on each heating panel facilitate installation, and there is no need to cut holes in expensive leather trim covers to route the cable. The harness is mistake-proof in that it can only be installed one way. Harness extensions allow flexibility in switch placement, and all include quick connects that do not require identification. Each kit includes a comprehensive installation manual, which is updated as required to keep pace with industry changes. All parts are tested prior to packaging to ensure proper functioning. The current Carbotex design represents the collective knowledge and experience of an original equipment supplier (W.E.T. Automotive Systems Ltd.) combined with important installer/customer feedback. The result is a safe, comfortable, easily installed seat heater system that provides outstanding customer value for the money.